Eduscan Group offers three interesting camps this summer for the age groups from 4-16 years. All courses are designed by renowned educational psychologist Dr. Alka Kalra. 1. Leadership training programme: It trains the kids on various leadership skills such as creative thinking, memory & concentration, public speaking etc. It also works on the physical development of the kids through activities like swimming, yoga, sports and much more. 2. Progressive academic training: It focuses on training the kids with interesting reading, writing, comprehension, math & memory to enhance their academic abilities. Swimming, yoga, and sports are also a part of this course to make the whole experience fun and enjoyable. 3. Skills development training: This course includes all the summer fun activities such as swimming, karate, arts & crafts, dancing, singing, yoga and much more. We are popular not only because of our unique programs but also because of the additional elements our courses offer such as the final day function and the optional over-night camp. 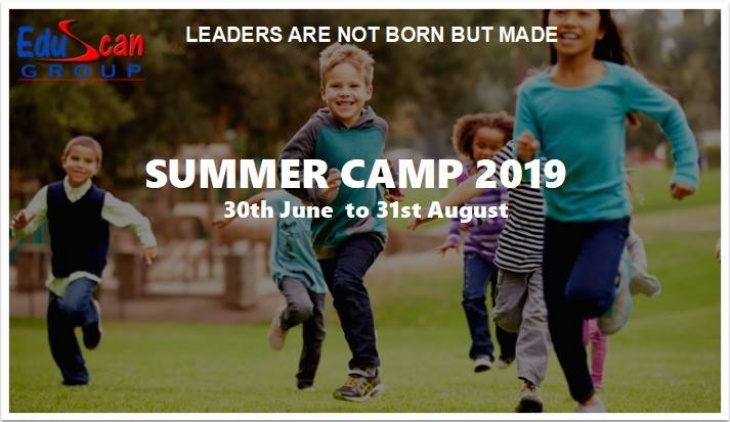 • True to our mantra that leaders are not born but made, they ensure that each child builds self-confidence and esteem by performing their acquired skills on stage. • The optional over-night camp is a unique opportunity for the day campers, to stay independently under the supervision of the teachers. This experience is offered once during the camp and it helps children build their social skills and independence. We have special discounts for siblings and groups of 5 or more. We also have an early bird offer which is valid till 15th June. Office Location: 104, Emgate building, Business Bay, Dubai, U.A.E and 304, Robot Park Square, Sharjah, U.A.E. Fees for Dubai: Skills development: AED 225/week*, Leadership Training: AED 299/week* & Progressive Academic Training: 299/week*. Transportation is available at AED 100/week*. Fees for Sharjah: Skills development: AED 202/week*, Leadership Training: AED 269/week* & Progressive Academic Training: 269/week*. Transportation is available at AED 100/week*. *It could vary based on the combinations selected.